With Valentine's Day just ten days away, Filipinos may still not be sure of what to get for or how to spend that red letter day with their loved ones. Luckily for them,Voyager Innovations and PayMaya Philippines, the digital innovations units of PLDT and Smart Communications, Inc. (Smart), have the ultimate wingmen for them. 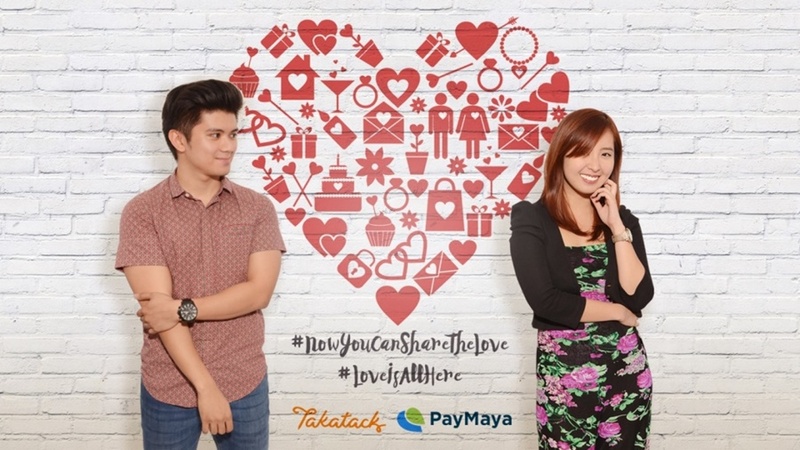 Shopping discovery platform Takatack and digital payments mobile app PayMaya can help Filipinos ace the two most challenging parts of this special day - gifts and dates. Takatack has all the traditional gifts you may want to give your special someone, such as chocolates and sweets. And with over 400,000 products, the site should also be your go-to destination if you want to choose a more unique gift, such as a new camera for the budding photographer in your life or a baking set for your favorite chef. Rebecca Ricalde, Assistant Vice President for Digital Commerce at Voyager Innovations, believes that the wide range of products at Takatack makes it the best place to choose your Valentine’s Day gift. Once you find the right gift, you can have it delivered directly to your special someone for a one-of-a-kind, doorstep surprise, which Ricalde feels is a nice touch for the occasion. “Much of what makes Valentine’s Day exciting is anticipation. You look forward to February 14, knowing that you’ll be able to spend quality time with your special someone. Sending them a gift via Takatack communicates this excitement to them in a way that nothing else can. A gift says that you are thinking of them and are counting the hours until you can celebrate the holiday together,” she said. Takatack also feels that romance doesn’t need to be expensive. Beginning February 1st and ending on the day of Valentine’s itself on February 14th, Takatack will offer a selection of special gifts from partner merchants that come with a discount. As these have all been curated by Takatack, customers will find it easier to choose a great gift for their special someone. The categories in this curated selection include: For Him, For Her, and Love Wins. Takatack will also offer several other promos. From February 1 to 12, a coupon code will allow users to get 500 pesos off a minimum purchase of 2000 pesos, so long as the items are fulfilled by Takatack. From February 1 - 5 and again from February 8 to 14, a coupon code will be revealed at 2:14 each day and expire at 2:14 the next day that will give new users a one-time 15% off discount for items fulfilled by Takatack for a maximum discount of 2000 pesos. Once you’ve ordered the perfect gifts from Takatack, you still need to actually celebrate Valentine’s day on Sunday, February 14. Unfortunately, many of the one-of-a-kind experiences you would want to share with your special someone on that day may require a credit card, and fewer than 5% of Filipinos own one. What, then, is the hopeful lover supposed to do? For them, there is PayMaya. Launched late last year, PayMaya is a free digital payments mobile app that gives you a unique card number so that you can pay online without a credit card. Getting PayMaya is easy, fast, and FREE. To get your online payment details, all you need to do is download the PayMaya app, which is available on both the App Store and Google Store, and sign up with your mobile number. You are then issued a Visa card number, its expiration date, and a security code. PayMaya functions like a prepaid card - you can load it up at any 7-Eleven, SM Business Center or Robinson’s Business Center and then shop online or sign up to subscriptions wherever VISA is accepted. In addition to serving as a free online payment app, PayMaya also offers a physical card that you can use to pay at brick-and-mortar stores wherever Visa is accepted. PayMaya is powered by VISA and is regulated by the Bangko Sentral ng Pilipinas to ensure all your transactions are secure. You could, for example, take your Valentine’s Day date to watch a concert that you booked on TicketWorld, before ending the evening at your home, ordering delivery from foodpanda and watching a romantic comedy on recent Philippine arrival, Netflix. Of course, you could splurge even further and choose to book seats on Philippine airlines and a stay at an exotic AirBNB in another city or country even, all courtesy of PayMaya. Now how’s that for a Valentine’s day to remember?